Greetings DC fashion lovers. Are you tired of this cold like I am? Bring on the Spring! While you’re dreaming of warmer weather, here are my #TrendingTuesday picks for this week. Enjoy! Don’t get me wrong, I LOVE a sky-high heel but I could not be more excited about the resurgence of the Kitten Heel. It’s so versatile and more comfortable! Do you have a pair you just cant get enough of? Tweet me or tag me in an Instagram with your favorite Kitten Heel. The first thing that comes to mind when most people think of a mule is Moscow — Moscow Mules… Not today! The Mule is back and sexier than ever. With so many options you can find the right mule for your style. Need a pair to go with your leather leggings or skinny jeans? 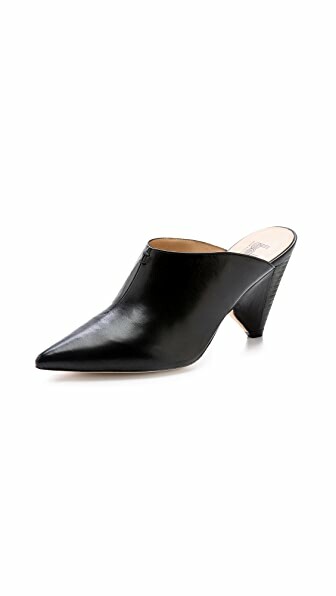 Check out the pointed toe two-piece runway mule from Express. I love the cutouts and the pointed toe, just enough skin to keep them guessing. Want a more casual mule? Pair this Chloe Platform mule with white jeans or a flow sundress is a great way to show your inner boho style. Looking to channel your inner Mary Kate and Ashley Olsen? Look no further than the Belle by Sigerson Morrison Eris mules. Pair this with a pair of black-cropped pants and a chunky knit or distressed denim with a menswear inspired blazer. Don’t forget the dark sunnies and a Starbucks cup! Do you have a pair of mules you love? Don’t understand this trend? Tweet me or comment below.